Philips AVENT orthodontic, collapsible and symmetrical teats respect the natural development of baby's palate, teeth and gums. All philips avent soothers are made of silicone and are taste and odour-free. Snap-on protective cap included. 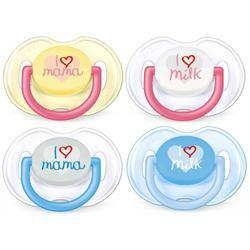 Note: Pacifiers shown are for illustrative purposes only and may differ from actual product.